Alford Image Library - Alford Bus Fire at Tillyfourie. Alford Bus Fire at Tillyfourie. 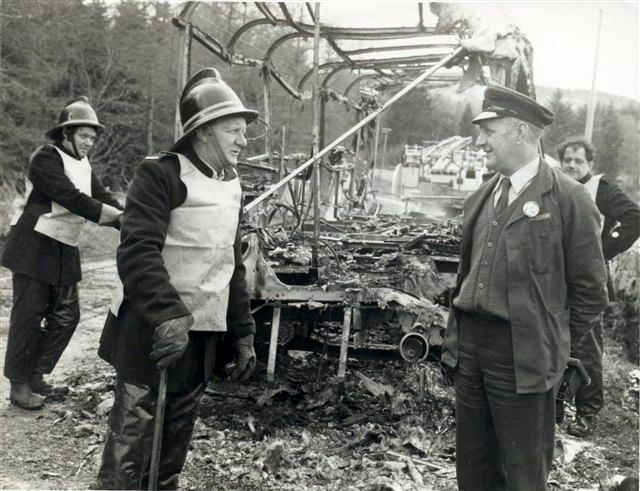 Forbes says: "The driver in the foreground is Ronnie Fraser and the senior fireman talking to him is Jock Milne, a well known Alford newsagent and character. The other fireman standing behind Ronnie is either Ian or Alan Murray (not positive as to his Christian name but his younger brother and site contributor, Les Murray, will put me right on that). I don't know the name of the other fireman but I'm sure someone else will. The photo was sent to me some years ago by my life-long pal, John Fraser, who is Ronnie's nephew and although we're not sure of the date, John feels it was taken during the early to mid 1980's." The other fireman is Bert Christie. I recall that incident. If I remember correctly one of the passengers went back on to collect the fare money - a Mr Cruikshank I think. Ronnie Fraser used to stay in Littlewood Place.